We have collected and analysed 50 expert reviews and 260 user reviews from international sources. Experts rate this product 80/100 and users rate it 88/100. The average review date is 14-08-2018. We have compared these reviews to 213025 reviews from other Smart Watches & Activity Trackers. The alaScore™ for this product is 98/100 = Excellent. Last update: 24-04-2019. Fitbit Versa review: How does Fitbit's latest attempt at a smartwatch stack up against the competition and is it an improvement over its first? While its feature set isn’t quite on par with that of its bigger brother the Ionic, the Fitbit Versa feels like the same watch but with a lighter and friendlier design and a much lower price point. 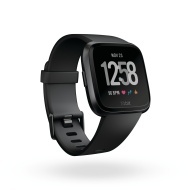 Fitbit is back with a refreshed version of its Ionic smartwatch, boasting a slimmer design and a reduced asking price to match. We've been pounding the pavement to test out the new Fitbit Versa for this in-depth review. Hands-on with Fitbit's latest smartwatch for women (and men); smaller than the Ionic.